AD VANDERVEEN rocks with The Stellar Cellar Band! „What started out as fun is working in the end…, now I’m a working man, the guitar is my tool.““ Once again Dutch singer-songwriter-guitarist Ad Vanderveen finds simple, precise lines to tell complex stories. „“Working““ is an example of his autobiographical songs that frequently talk about his love of music and his life as a musician. The Stellar Cellar Band features ten strong songs with reflections on life – one of this exceptional songwriter’s main qualities. In 20 years and on almost as many albums Vanderveen has established himself as a creative force to be reckoned with on the Americana scene in Europe and outside. This time around, he chose a different approach than on the highly lauded, predominantly quiet double album Presents Of The Past/Requests Revisited. 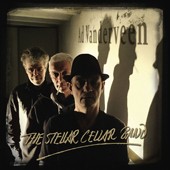 Vanderveen recorded The Stellar Cellar Band with two old friends in a powerful trio format. The result is passionate, no-frills rock’n’roll mixed with folk, country and blues and a garage-y vibe, recorded at the place where he took the first steps in his career, at the Stellar Cellar in Amsterdam. Since the early 90s, Ad Vanderveen – who has Canadian blood in his family – has been spreading his musical message throughout the European club scene and the world since the early 90s. This fall he will be 60 years old. In 2003 he joined Blue Rose Records with The Moment That Matters and continued with mile marker albums like Still Now (2008), Days Of The Greats (2011), Driven By A Dream (2012) and last year’s Presents Of The Past/Requests Revisited. On Blue Rose Ad Vanderveen, along with his colleagues Hank Shizzoe, Markus Rill and Iain Matthews, is one of the most important European proponents of American singer-songwriter culture with a propensity for roots rock and rock’n’roll. Ad Vanderveen has always been able to do both, sensitive, storytelling, acoustic folk and loud, electric roots-rock with a fierce band and extensive guitar solos. Yin and yang, just like the Dylans and Youngs he finds creativity and inspiration in these opposite extremes. Regarding Dylan …. More on that later. Regarding Neil Young: Ad emancipated himself from this oft-used reference point regarding vocal sound, guitar style and song structures – on the one hand. On the other hand, he never denied his affinity for Young, ironically calling his former backing band, the O’Neils. The Stellar Cellar Band undeniably pursues the spirit of Zuma, Rust Never Sleeps or Ragged Glory. That’s exactly how the album starts with „“Pioneer Here““, powerful, direct, guitar-driven rock and an early testament to the trio’s great chemistry. By coincidence Vanderveen ran into Nico de Gooijer, his 80s drummer, and recreated old times. Bassist Timon van Heerdt is a longtime Vanderveen companion as multi-instrumentalist on stage and in the studio. „“Passin‘ By““, a 5-minute slow blues with slide guitar and harmonica, is followed by the rocking „“Working““, the album’s motto song. „“While The Night Is Still Young““ suggests wordplay on the Stills Young Band and „“Long May You Run““, also a musical point of reference. „“Fool In My Life““ is straight & funky, very dynamic and featuring a blistering Vanderveen solo that will probably receive an extended treatment in live performances. The autobiographical „“New Musical Dreams““ refers to the current project and its invigorative powers – it is indeed the first time Vanderveen plays in a trio. „“Melancholy Blues““ delivers what the title promises, a moody ballad with folk and blues leanings, harmonica and a fine-sounding guitar – it segues perfectly into „“Load Of Memories““ which is nothing less than a romantic, nostalgic stroke of country rock genius! The aptly-titled „“Highway““ is an easy-going, uptempo highway song. And closing this vivid and colorful album is (after „“When I Paint My Masterpiece““ on Driven By A Dream) another Dylan song in Ad Vanderveen’s repertoire: „“Forever Young““ – an homage to Dylan but also a reaffirmation of his own credo. Kommentare deaktiviert für AD VANDERVEEN rocks with The Stellar Cellar Band! AD VANDERVEEN rockt mit der Stellar Cellar Band!